Scotland lock Gordon Brown won the first of his 30 caps against South Africa in 1969. 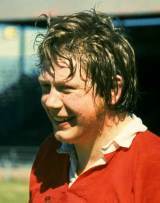 He played at the same time as his brother, Peter, whom he replaced in Scotland's Five Nations game with Wales in 1970. Brown's talents led to him winning eight caps for the British and Irish Lions between 1971 and 1977, playing a major part alongside Willie John Mcbride in helping the Lions to famous series victories in New Zealand and South Africa in 1971 and 1974 respectively. He played his final Test match for the Lions against the All Blacks in 1977. Brown died of cancer in 2001, aged 53.